Contemporary judo is in essence a martial art, but also an Olympic sport. The mixture of the two stems from the origin of judo as a physical, mental and moral pedagogy developed by Japanese educator Jigorō Kanō in 1882. Judo was based on traditional jujutsu, and descendant arts from judo include sambo and Brazilian jiu-jitsu. The rules of judo have since developed into the Olympic sport we know today where some throws have been banned due to injury risks in competitions, and many countries have added their own unique flair to the styles of fighting. Judo has been an Olympic sport since the 1964 Tokyo games for men, and since the 1992 Barcelona games for women, and has been a Paralympic sport for visually impaired (VI) since the 1988 Seoul games. Judo means “the gentle way”, and the competitive objective of judo is to use safe and effective methods to throw an opponent to the ground, immobilise or subdue them with a pin, or force them to submit with an armlock or a strangle. A practicioner of judo is called a judoka, and during excercises the player performing a technique is called tori (taker), and the player to whom it is perfomed is called uke (receiver). The difference between contemporary judo and many other traditional martial arts is judo’s emphasis on randori or free practice, where the specific techniques taught in judo are implemented against an opponent. This can be either in a light form where both players offer little resistance to being thrown, or a more competitive form, which resembles matches in real competitions. The most simple, yet very true answer to that question is because you will have a lot of fun. Judo is a high intensity sport, yet everyone can join at their own level, and most players experience rapid progression. But just as much as judo helps develop physical strength, flexibility, balance, endurance, and control, it also trains all those aspects mentally. Judo is rooted in respect and gentleness, and through the judo community many players experience rich social gains. No matter your knowledge or skills in judo you could not train without your partner, and they could not train without you, and this mutual dependence on each other helps create a humble environment where everyone is appreciated. Judo also transcends national boundaries, as it is the second largest sport in the world in number of players – only surpassed by football. 20 million players practice judo worldwide, and because of its clear benefits associated with learning, judo has been made an integral part of many education systems such as primary and secondary schools, and like here with our very own university club. 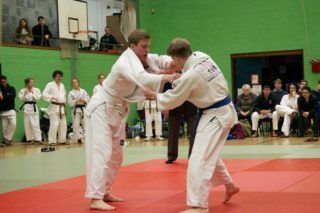 At Oxford University judo is a full blue sport, and we compete in a high intensity Varsity match against Cambridge in February with both city teams and university men and women’s teams participating. A video of the Oxford ippons from the 2016 match can be seen here (Oxford wears white belts). Many players who complete the beginners’ course go on to compete in the Varsity matches. 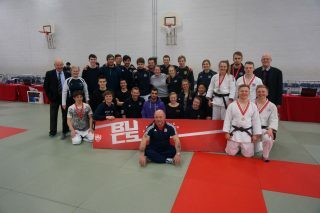 Even for players who don’t aim for Varsity, Oxford Judo competes in many competitions for all level players. The social aspect of going to a competition as a team is a great bonding experience, and win or lose we all have a great time together. 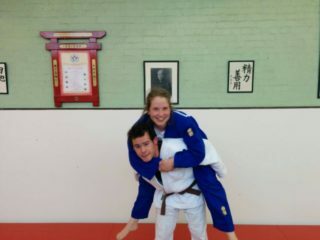 The club also has many technical players who don’t compete, so judo really is a sport that anyone can make their own. Judoka wear a judogi, which is inspired by the Japanese kimono. Judogis have a strong weave so players can grip their opponents and throw them without harming the clothing. Judogis are either white or blue. Most beginners will start with wearing a white gi. In case you don’t already own a gi, you are welcome to come to your first sessions in regular training clothing, preferably with long sleeves and legs. T-shirts and shorts will also do during the first few sessions. Please try to avoid hoodies and sharp items such as zippers. Women always wear a t-shirt under their judogi jacket. Judo is practiced barefoot, and keep a good hygiene as you will be in close proximity with your training partners. Students who join the BJA’s Student Voucher Scheme get a free judogi and belt. Talk to the coaches about this offer. The coaches can also offer advice on which advanced gis to purchase later. Red (6th kyu), yellow (5th kyu), orange (4th kyu), green (3rd kyu), blue (2nd kyu), brown (1st kyu). After the kyu grades (coloured belts) are the dan grades (black belts). 1st to 5th dan judoka wear plain black belts, 6th to 8th dan judoka may wear a red and white belt, and 9th and 10th dan judoka may wear a full red belt. When you arrive at Iffley Sport Centre go to the changing rooms, and when walking from the changing rooms to the dojo please wear footwear (zori). Take your footwear off outside the dojo, and before entering the mat for the first time you do a standing bow (ritsu rei) towards the mat (standing with feet together and arms down the side you nod towards the mat). Judo is always practiced on soft mats, and for insurance reasons it is not allowed to start training without the presence of a coach. 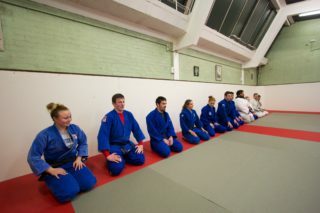 When the coach is ready to start the session, all players form a line facing the photo of judo’s founder Jigorō Kanō, and the coach or coaches stand on the opposite side facing the players. In the dojo at Iffley Sport Centre the players line up beneath the windows and face the wall with the door. In usual training higher grades stand to the right towards the door, and the grades descend gradually to the novices standing to the left. During the beginners’ course most players will be novices. The coach will instruct the players to kneel down by calling “seiza”. The coach will then ask players to do a kneeling bow (za rei) by calling “rei”. The coach then instructs players to get up and commence the training session. If in doubt just follow the coach’s lead when to kneel down, when to bow, and when to get up. One of the first things you will learn during the beginners’ course is one of the most fundamental skills of judo – ukemi – which is falling properly in order to prevent injuries. Players will also learn standing throws (tachi-waza) such as O-soto-gari, O-uchi-gari, Tai-otoshi, and Ippon-seoi-nage. Another important part of judo is groundwork (ne-waza), and the beginners’ course will cover how to turn over a partner, and hold downs such as Kesa-gatame, Mune-gatame, Tate-shiho-gatame, Kami-shiho-gatame plus escapes from those hold downs. In order to implement these techniques in real situations players will pair up and do free practice (randori) either standing (tachi-waza) or on the ground (ne-waza). Higher grade players will often be at the beginner sessions to help the head coach. Ask these players about any questions you have, as they are there to help you progress. Some beginners’ courses have progressed so rapidly that coaches have included basic introductions to armlocks and strangles within the first eight weeks. At the end of the beginners’ course the coaches will grade players, and they are welcome to join the regular sessions on Tuesdays and Sundays. At the end of the session players line up like in the beginning, and the coach instructs players to bow in the same manner. In case there are assistant coaches next to the lead coach, these will then turn towards the lead coach and bow again. Upon leaving the dojo players turn to face the mat and bow towards it before putting on their footwear and going to the changing rooms. Please be on time, and if you happen to arrive late, please wait on the side until you catch the coach’s attention and ask them for permission to join. If you need to leave early, please ask the coach for permission to leave. This is so everyone is accounted for.